With the earth’s population ever growing, air pollution and air quality is a major issue for many countries around the world. Air pollutants can lead to respiratory related illnesses in humans and animals, create acid rain, and deplete the ozone layer. Actions such as carpooling, reducing the use of fossil fuels, and simply turning off a light when leaving a room are all ways that reduce harmful CO2 levels in our atmosphere. There is also a natural source that eats away at harmful CO2 gases and that source is trees. Trees act like nature’s lungs. They take in CO2 gases from the air and then use those gases for energy during the photosynthesis process. A byproduct of photosynthesis is oxygen. Over the course of a year, one tree can absorb up to 13 pounds of CO2 gases. The loss of trees in cities has had devastating results. Heavy levels of CO2 gases in cities create thick smog and affect the natural ecosystem of the land. These concentrated levels of CO2 gases create a hostile environment for trees and plants, making it difficult for them to grow properly. Knowing the benefits, Dr Klaus Lackner, Director of the Lenfest Center for Sustainable Energy at Columbia University, came up with an innovative idea to reduce CO2 emissions in urban environments. Taking from his daughter’s prize winning 8th grade science fair project, Dr Lackner designed a machine that would pull CO2 from the air. Lackner’s daughter’s project proved that CO2 could be extracted from the air by using a fish tank pump and a battery. Lackner took his daughter’s idea further by designing his structure to act like a living tree. 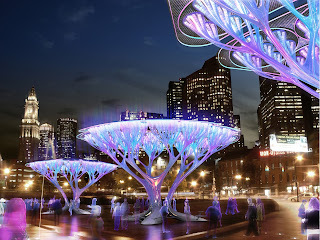 Inspired by Dr Lackner’s discovers, in Boston, MA, the Boston Treepod Initiative, developed by Mario Caceres and Christian Canonico of Influx_Studio from Paris France, in collaboration with ShiftBoston are proposing to use this environmental friendly technology to help curb CO2 gases in the city. By using biomimicry, or drawing inspiration from nature, Influx_Studio developed their tree-like structure to be powered by both solar and kinetic energy. Their artificial tree mimics what real trees do. It scrubs CO2 from the atmosphere and emits O2 and uses its own power to do so. To make their design more appealing to the eye, the international team drew inspiration from the dragon blood tree. The dragon blood tree is a prehistoric looking tree that grows in arid, dry climates. It has wide branches that form umbrella looking tops that provide wide swatches of shade on the ground below. Influx_Studio chose the dragon blood precisely for this reason. They needed a wide platform that could hold the sizeable solar panels that they would need to help power the tree. This young French team through trial and error realized that solar power would not be sufficient enough to fully power their trees. They decided that kinetic energy derived from human interaction would serve as an ancillary power source because of its simplicity. The team then concluded that by making their tree interactive it would beckon passersby to play with it. The Boston Treepods Initiative also proposed for the trees to be placed in groups or pods because this will increase their effectiveness. Joined together by see-saws and hammocks, the grouping of artificial trees instantly creates a small, but inviting urban park. As the hammocks and see-saws are used by visitors kinetic energy is created, thus helping power the CO2 extracting pumps. If the city of Boston were to benefit from the Treepods, the concept could be easily and cheaply replicated in polluted cities all over the world. The Treepods could be exceptionally beneficial in cities where smog levels are so high that natural trees and plants have a difficult time growing in. Treepods could also be successful in creating a healthier environment for people and animals in and around the city. Respiratory illnesses would also most likely drop in numbers. 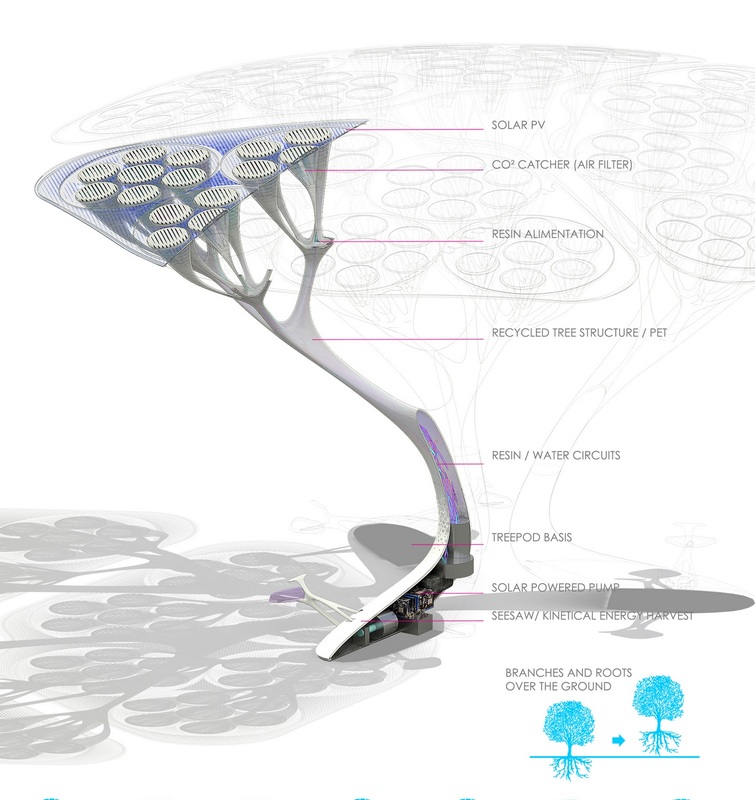 What other places do you think could benefit from Treepods? And what other types of air cleaning devices can you design? We’ll keep an eye out for Treepods coming to a city corner near you! Form following function at it's best. Who wouldn't want to add trees that are art to their backyard? Boston is a natural choice. How come there's not a nobel prize for this guys? They could sell the idea to ONU, or something, to try this at world's most polluted cities – São Paulo being one of them – and share an technology that would, maybe, save the world sometimes. What amazing technology! I would love to see these in Boston and especially in LA where my three year old nephew is being raised. Great post, Liz! What kind of power do they require? I might have a solution other than kenitic. I will need specifications of amperage and voltage. Nice, been looking for what seems like an eternity. I am an advocate of rainwater harvesting (RWH) and artificial recharge systems (ARS) as a mitigating measures to the deleterious effects of deforestation. RWH gathers the rain for various purposes and ARS stores the rainwater in the aquifers to help prevent downstream flooding; the main function of trees’ root systems. I suggest that apart from carbon sequestration, please include also these features in your artificial trees to approximate the function of trees. This way, a single unit of an artificial tree would help solve a lot of ecological problems brought by wanton destruction of our forests. And if you come up with the favorable design, may I request that the Philippines would be one of the first to test the prototype as we have been experiencing catastrophes as a result of massive rainfall and irresponsible cutting of trees. Thank you can best regards. As a chemist, I find the description of the treepods long on hyperbole and short on science. It is not apparent what becomes of the carbon dioxide. Is it reduced to carbon compounds and oxygen? Is it merely absorbed and sequested? THe explanation of “humidity swing” is meaningless. If the CO2 is merely absorbed ande not reduced, what is the purpose of the photovoltaics? Is the electricity used to drive pumps? Is the absorbed CO2 pumped to a caustic solution to convert it to carbonates? Is there really anything more to this than public sculptures lit with photovoltaics? We are a french high school students group in scientific studies and we decided to eye the “Boston Treepods” system and its chemical reactions in a personal project. Unfortunatly, we couldn’t found lots of details or references about the different components, consequently we can’t really analyse it. 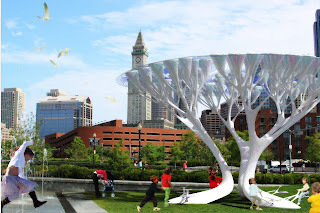 We would like to know if someone could help us by telling us details about boston treepods. Thank you, in advance for the time you’ve spent looking at our request. I am working with a team of producers to create an outdoor installation for a sustainable design event in Florida, USA in Jan 2014. 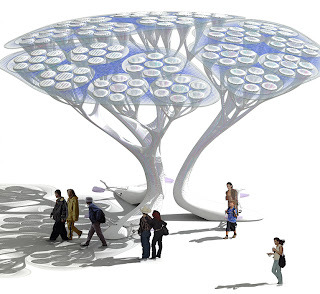 We believe the intelligent TREEPODS would be a perfect contribution. Are you still working to create these structures for urban environments? Please send me cost and timeline estimates for creating, manufacturing, shipping and installing up to six Treepod structures. I understand these ‘trees’ are designed for permanent installation. SHIFTboston does not sell or manufacture Treepods. We are simply an organization reporting on innovative designs local and international. I have been following this development ever since I saw a prototype tested in a stadium some years ago on TV. Can I please ask if you are ready to license the technology for production in India. CO2 to O2 without outside energy is an amazing invention. Hope you are willing to commercially share this technology especially if it is ready for mass production & installation. I eagerly await for a reply. We are currently working on a business plan and cannot release anything yet. We will keep you informed. Hello, I am a student at the University of Minnesota TC and I am very interested in the detailed chemistry behind it. I am part of a research program for a project called “Biology Saves the World”. I would really appreciate it if you could email me some of the exact chemistry of how the fish tank was able to absorb CO2 and emit O2. Thank you very much.